Happy Monday, dear readers! I am still out of town staying with the inlaws due to our evacuation due to the wildfires in Northern California, but I am still attempting to keep posting material on my blog. It's definitely not easy being away from home and my normal routine disrupted! I had tried out the products I will be sharing in this post just before the fires broke out and thankfully had my photos on my computer! Let's jump on in! 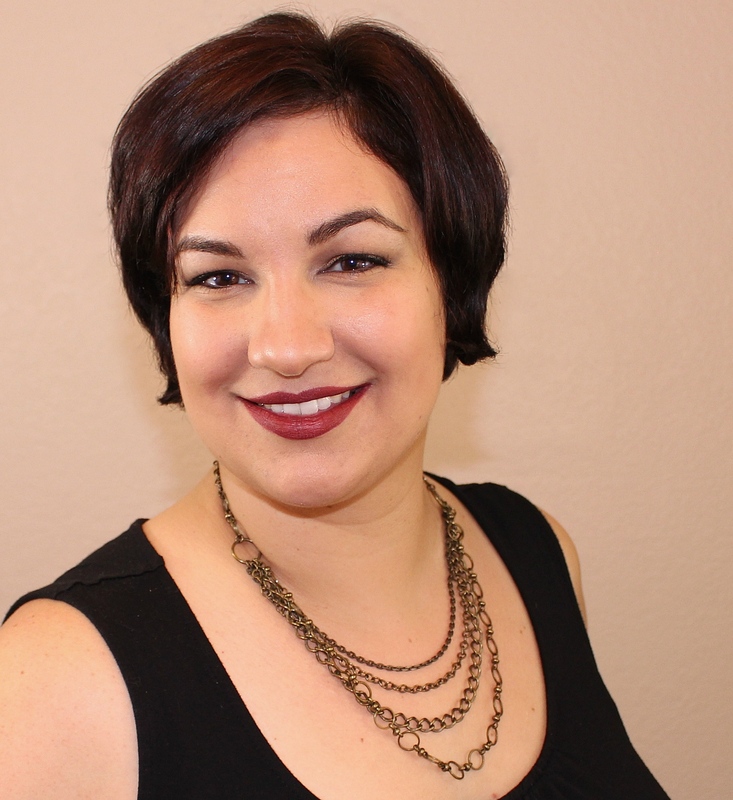 Today's blog post features another brand I discovered while attending Cosmoprof North America this summer. Inspired by Korean skincare products, BioRepublic SkinCare founders Paolo Mentonelli and Justin Hong wanted to bring the ease and convenience of the sheet mask to American consumers that had not yet reached US stores. At the time, Korean products were made with ingredients Americans did not want to use on their skin, and Paolo and Justin set out to create their own line of masks that were more in line with American preferences. 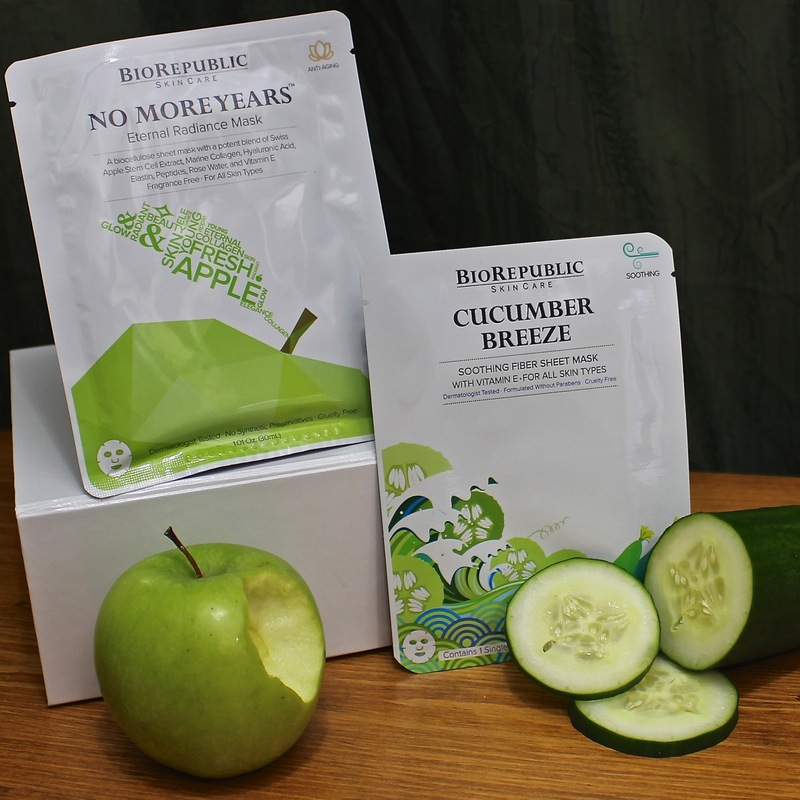 BioRepublic SkinCare masks are cruelty-free and made without parabens, sulfates, phthalates or triclosan. I had the pleasure of trying out two of their mask offerings and wanted to share my thoughts about them with you. Let's check them out! 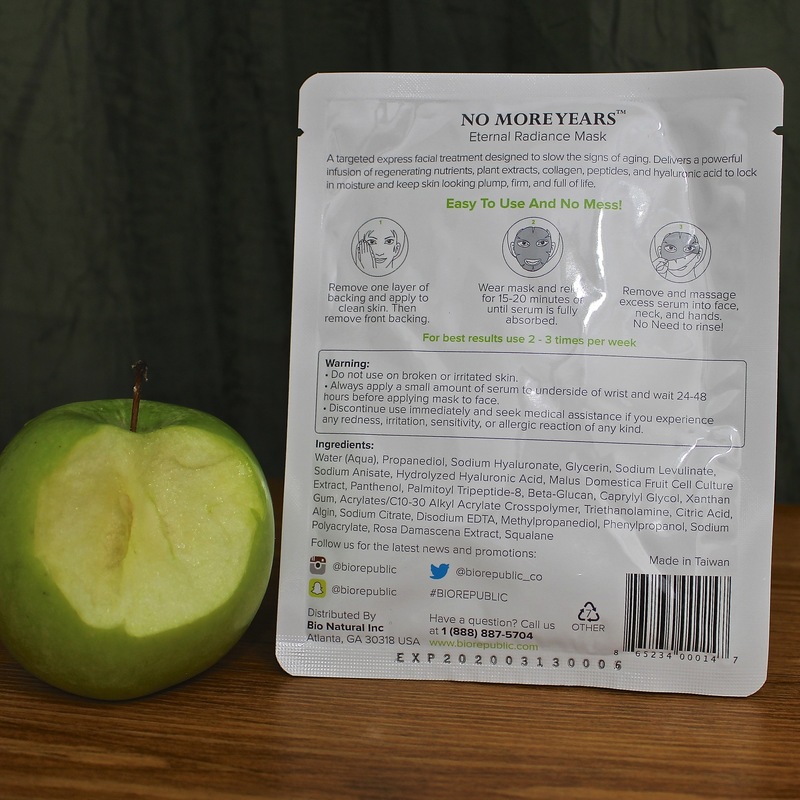 I don't know if I have the words to even describe just how much I loved this apple anti-aging mask! Upon opening the package, three layers come out of sealed foil pouch: an outer layer that is akin to tulle, the biocellulose mask itself, and the another outer layer of perforated cotton. While you are waiting, you might as well put something good in your body as well! *While this was certainly a fun photo to take, I don't recommend eating something that requires large bites. The mask does not stretch out when you do this and just comes off your chin. Even after just one use, my skin looked brighter and felt so soft! 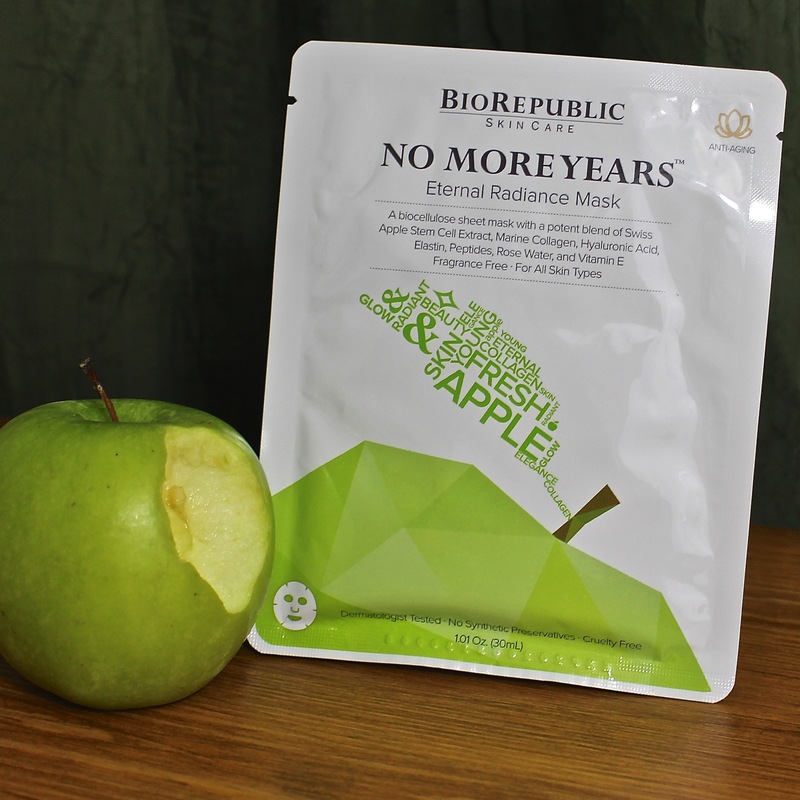 For best results, BioRepublic SkinCare suggests using this mask type two to three times per week, and based on my single use, I can believe it will make your skin look great with consistent use! This mask is recommended for sensitive, dry, or combination skin types. My skin is definitely sensitive, and I am happy to report I had no issues at all with this mask. I also have combination to oily skin, and I didn't find it to be too heavy for my skin. 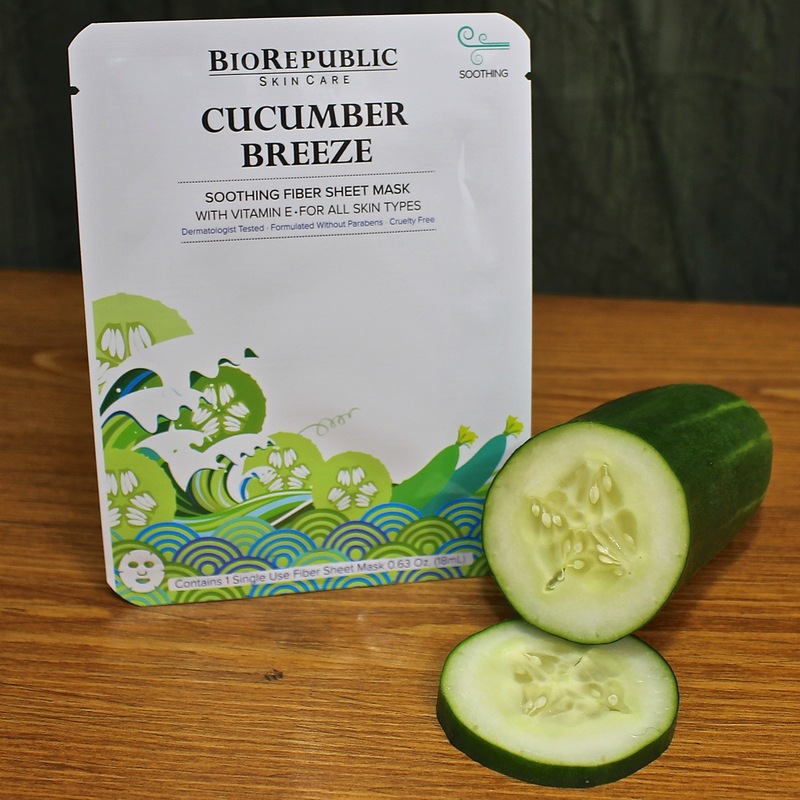 For those of you that are familiar with sheet masks, the Cucumber Breeze sheet mask is of similar design as others on the market. The sheet mask itself is made of a biodegradable fiber, and it is soaked in a serum designed to sooth stressed skin and improve the complexion. 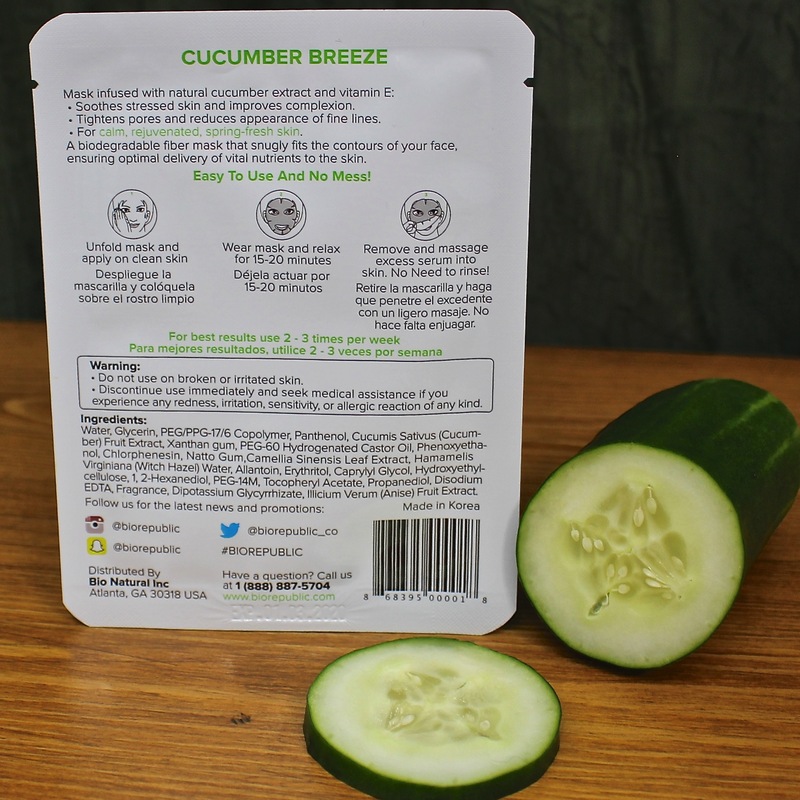 While the previous mask was sandwiched between three layers for protection, the Cucumber Breeze mask does not have any added layers and is just folded onto itself. It unwrapped nicely and rested in place on my face for 20 minutes. 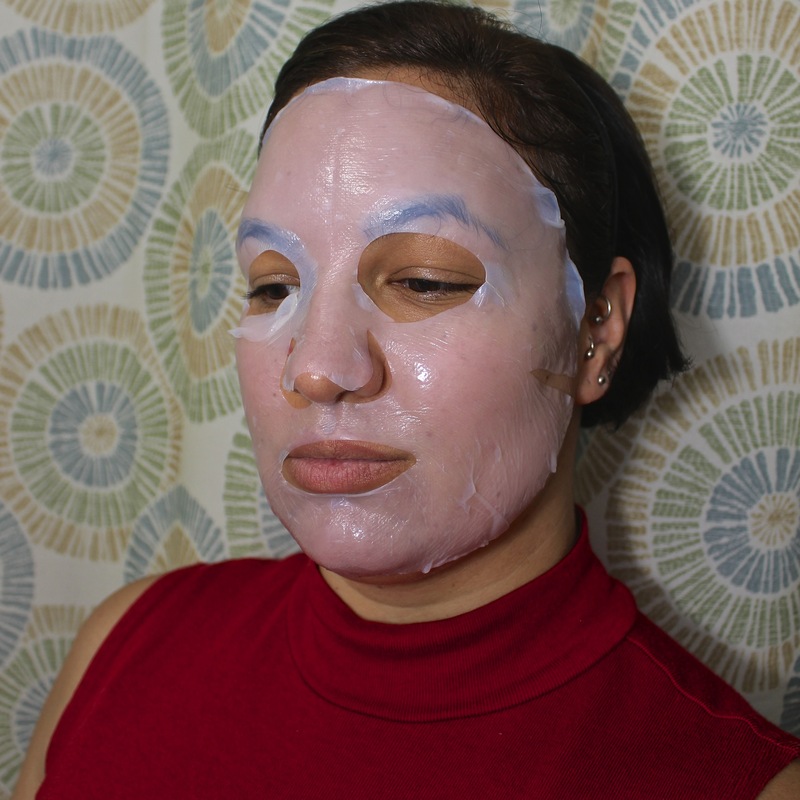 While the sheet mask does conform easily to the face, it doesn't quite cling as well as the previously mentioned biocellulose mask. 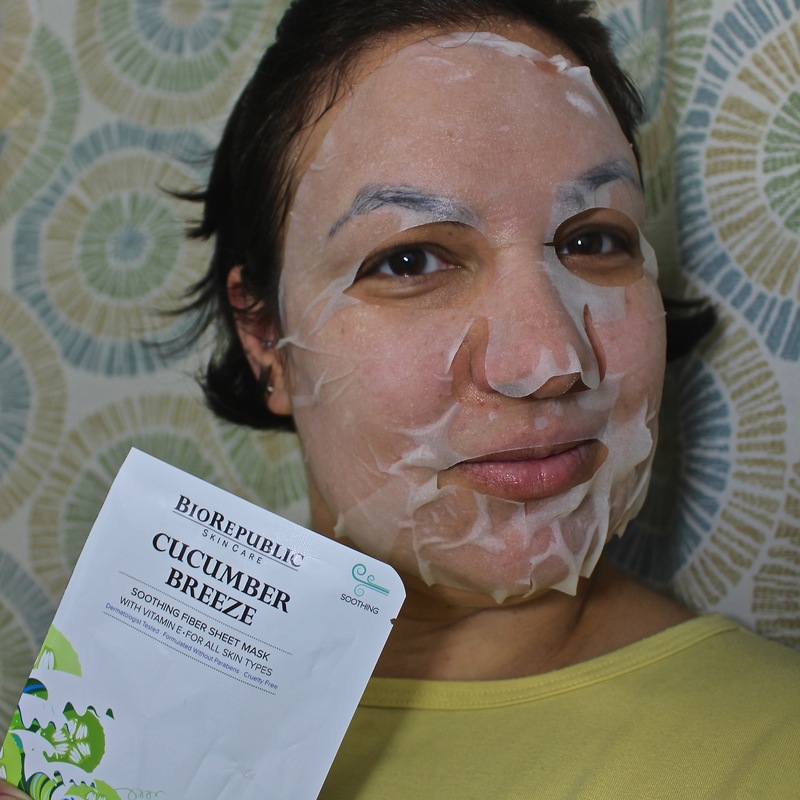 The Cucumber Breeze mask felt really nice on my skin, and it left my face with a lovely glow! It definitely felt soothing on my face, and I had no issues with it causing redness or making me break out. Eternal Radiance Biocellulose Sheet Mask because I liked how well it adhered to my face, although both these masks are fabulous. You can't go wrong with either of them! I have an eye on a few of the others and hope to try them out soon! I just started doing masks! I will definitely have to check this one out as I am starting to get some wrinkles! I have to admit that I haven't used a mask in years. I'm starting to have a bit of dried skin problem,so those masks sounds awesome. I wonder if the apple one smells like apples as well. I have never tried a mask. It's funny to think of apples as anti-aging since they are always going brown, but they do seem like they would be good for your skin. (Sorry -- random thought!) I'll have to get brave and give one a try. Thanks for the review and fun pictures. I am always so scared to try anything new on my face because my skin is just so sensitive but... This does look like a rather soothing mask - and if anything, I can scare my husband with it? LOL! When I was a teenager we girls used masks at slumber parties and painted our nails. As an adult I'd only had masks during professional facials. I love that the mask you recommend is one that I can do at home and that I will actually see a difference in my skin afterward. Many prayers go out to you and your neighbors. I live in Sacramento, and most everyone I know has a friend, relative, acquaintance or co-worker that's been affected. I'm at the point where I'm definitely more concerned about my skin regimen and have been actively looking for things to add to my regimen. The mask seems like a good choice for me. This mask looks Heavenly. I need to treat myself to a spa day soon. I love pampering my skin and using mask. I've been meaning to try out some masks. I know my skin could really benefit from them! when it comes to face masks, I'm always excited about cucumber flavour/scented masks! I've never tried one with apple infused. Hands up i love a good sheet mask and these sound awesome I love they are infused with apples and cucumbers I could definitely try one of each. BioRepublic SkinCare masks sound perfect for me. I am always looking for new products to try. My skin has been getting so dry with the colder weather. I love me some facial masks. I will definitely will have to try this line out! You are so adorable! I really enjoy their masks... they're so refreshing!! Those booth look nice, I must have missed their booth at CosmoProf darn it! I love your apple face. I use masks often and I like that the BioRepublic doesn't fall like some of them do. While a sheet mask can be messy they always make me feel better. I need to use this mask soon! It looks refreshing and it gives you a radiant glow. I love me a good sheet mask. Cucumber products are always gentle and soothing on my acne-prone skin. I love the BioRepublic Brand. I have many of their masks and they just feel so good on my skin and after. It sounds good! I just don't like how sheet masks feel on my face. I hope the fires subside soon! Anyway, I love the masks you use. I will give them a shot! Good evening, young Sky Walker. You look a bit like a Storm Trooper in the apple mask! I love apples. I'd be all into that one for sure! I'm glad you said it's good. want it! Oh I need to def try biorepublic masks they look great. I have dry skin so I love a good hydrating mask. These seem great. I once scared myself wearing a mask I forgotten about lol. Stay safe! Skin masks are one of those things that I love to use. These two look like they would be amazing. These masks seem to be amazing. Hope you get back home soon. hugs.